Well, what if they sort of could? Or at least, take away your ability to think for yourself? That is sort of the premise of Ian Tregillis’ The Mechanical. 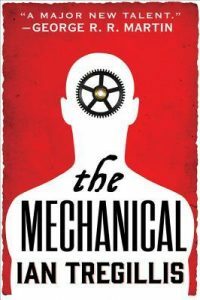 The Mechanical is set in a world where, sometime after Europeans stumbled across the Americas, the Dutch find a way to make sentient machines, through some alchemical process discovered by famous Dutch scientist Christiaan Huygens (what?!? You’ve never heard of him? He discovered a moon of Saturn, invented the pendulum clock, and was a major authority on optics). This gives the Dutch a leg up in the world, and allows them to conquer pretty much all of Europe. Seemingly only the French remain to resist, and they must do this from a small enclave in exile on the North American continent. This is the backdrop for an amazing story of court intrigue, international politics, and a different approach to the discussion of slavery. This is, because, we quickly come to learn that the machines the Dutch build their empire on not only think, but have some sort of free will, a free will that is subdued by whatever process creates them. Whenever they try to do anything that is not in direct fulfillment of their masters’ wishes, they experience extreme pain, a pain that grows until it is completely intolerable and the machine is forced to act to subdue the pain. “The head faded as he [one of the machines] abandoned his own wishes in favor of his masters’ whims.” Thus, the machines are slaves, forced to subvert their own will to that of their human masters’. Tregillis does a great job of describing the torment the machines feel whenever they try to do something on their own. It is always nice to find a book that both provides a very interesting plot as well as thought-provoking material. The discussions about free will flow naturally through the course of the book, they are not force fed or heavy handed. Rather, they are integral to the relationship between the machines and the humans. They drive the plot forward. Tregillis does a great job of pulling these themes forward but in service of his story. I think my ony quibble is that, at the end of the story, some of the actions of some of the characters seem less than reasonable. One can chalk this up to the trauma some of them have endured up to that point, but it still seemed a little forced, like Tregillis needed a way to get to a certain point in the plot and this was the best he could come up with. However, in spite of this, I am greatly looking forward to reading the next books in the series.